which opens and closes following the movement of the sun. This special characteristic has led the flower to be dubbed the “sun’s fiancee”. It belongs to the Asteraceae family. It comes in different cultivars but growing it is easy. 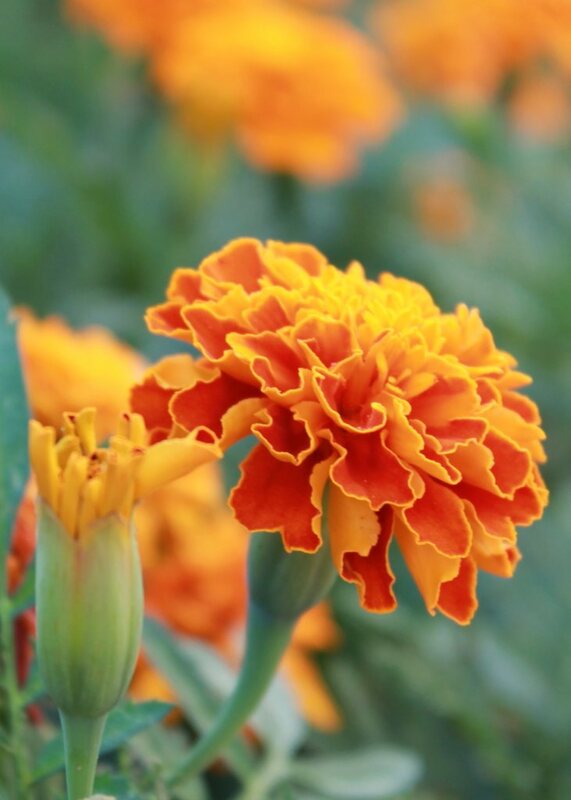 Simply sow in ordinary soil that drains well between April and June, and that’s enough for the marigold to reseed itself naturally from one year to the next. It can be sown in a pot or in a garden and only requires very little care. Native to the Mediterranean area, it is grown in all parts of the world that benefit from a temperate climate. It grows to a height of 16 to 28 inches (40 to 70 cm). Its blooming begins with the first days of spring and can last during the entire year if the weather is mild enough. Its flowers are edible. From Greek and Roman times, use of medicinal marigold is noted in culinary tradition and also in cosmetics. It won over the hearts of Europeans in the 7th century, and its cultivation spread during the Middle Ages. Its medicinal properties brought attention to it: it soothes insect bites, snake bites, and seemed effective against jaundice, conjunctivitis and fever. Herbalists and doctors took to the plant and added it as an ingredient in personal hygiene and skin products thanks to its therapeutic benefits. Which are these? What is its impact on the body? Which dosages make for flawless results? Medicinal marigold contains active ingredients that impart anti-inflammatory, anti-wheal, antioxidant, analgesic and hydrating properties. These compounds are flavonoids, triterpenes, saponins, salicylic acid and mucilage. Its essential oil has very interesting antibacterial properties. Used in external topical preparations, they are effective to alleviate minor skin discomforts (erythema on bottoms, babies’ milk crusts, small wounds, etc.). Its relaxing, soothing and wound-healing properties are also remarkable when dealing with sunburns, scratches, chapped lips and skin, crevasses, dermatitis, boils, etc. 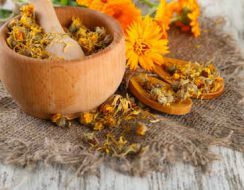 To remove the sting from light burn wounds, insect bites and hives, medicinal marigold (as a cream or an ointment) is an unmatchable anti-inflammatory and anti-wheal agent. 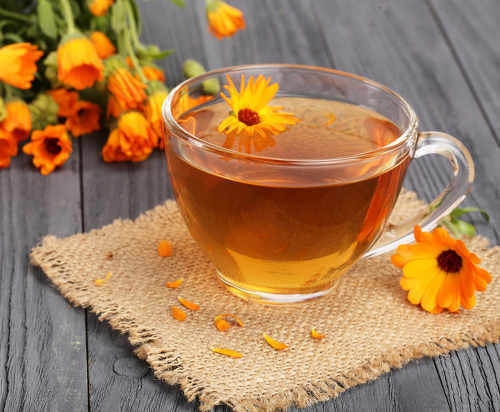 When ingested (infusions), medicinal marigold not only acts on the immune system and lowers fever, it also alleviates throat and mouth inflammation and hepatic and gastric disorders. It thus cleanses the liver, reduces gastric inflammation and premenstrual syndrome. Infusions prepared from medicinal marigold are effective in case of digestive disorders, mycosis, premenstrual pain or to regulate the menstrual cycle. For that you just need to boil 7 fl. oz. (200 ml) water and toss 2 teaspoon dried flowers in it. Drink 1 cup 3 times a day for maximum 15 days. When used to dip a compress, the above-mentioned infusion can be applied to the eyes in case of ocular fatigue or to cleanse small wounds. For massage, medicinal marigold essential oil is applied on irritated skin 3 times a day. Be careful: Drinking infusions is not recommended for pregnant women, nursing mothers and young children (under 6 years old). Marigold is the ornamental flower with immense benefits to human health. Thanks of sharing information on Marigold.